Earlier this week, an interesting discussion started on the PPCChat hashtag on Twitter regarding the use of competitive PPC intelligence obtained from tools such as SEMrush, SpyFu, and iSpionage, as well as visiting competitor websites. I commented that I was doing competitor research, and wondered how many remarketing ads I’d see as a result. A few PPCChat’ers suggested some ways to avoid being retargeted. Shashikant Kore recommended using the incognito window of Chrome. Dan Nicholson said he uses a separate Google account or user in Chrome to avoid that problem. These are great suggestions if you don’t want to be followed around by irrelevant remarketing ads. I do this as well – at a minimum, I’ll visit competitor landing pages and take screen shots to share with our clients. Often, we get ideas from competitor landing pages – or at least we learn what not to do! But what if you want to see what competitors are doing with remarketing? There are definitely instances where this would be helpful, especially if your clients are asking for this information. Julie Bacchini said she subscribes to email lists of competitors and follows them on social media. I’ve done this before, or I’ll set up Google Alerts for the competitor name to see what shows up. General PSA: don’t ever rely on a competitor tool for competitor spend estimates that are anywhere close to accurate. I agreed, saying we use the data directionally, rather than as the exact amount. For example, if the tool says your client is spending $10,000 per month and Competitor A is spending $50,000 per month, you can assume that Competitor A is outspending your client by a factor of 5 to 1. But Kirk Williams argued that even directional data can be off the mark: “When I analyzed my clients it ranged from like -200% to +500% in accuracy.” Jason Channell countered by saying he’d tested several of the tools against campaigns where he knew the spend, and the tool was accurate within plus or minus 20%. That’s been my experience as well. I can live with a margin of +/- 20%. So why is Kirk seeing estimates that are that far off? It could be that some competitors (or his clients) are using dayparting, geotargeting, or even device targeting that’s throwing off the tools. Remember, competitive PPC intelligence tools scrape the SERPs and estimate – they don’t actually KNOW what everyone is spending. They scrape and guess. So things like geotargeting can throw off the accuracy, or even cause the tools to report no spend at all. If tools are really so inaccurate, should we even use them? The consensus seemed to be that yes, competitor intelligence tools still have value, especially those that show the ads and keywords competitors are using (most tools do this). As far as spend goes, Kirk Williams had a great idea: just say “tool estimates aren’t exact, but it does look like you’re on the low end of spend.” I always include a caveat in any competitor report saying the numbers are estimates only. Finally, I loved the suggestion from Kevin Cronin: “I try to shift conversation from competitor spend to ‘is this the right channel/targeting for you? If yes, take advantage.’” I’ve written many a post on this blog about PPC strategy, and that’s what Kevin’s point gets to – what is your ultimate goal anyway? Focus on that and not your competitors. One of the great aspects of PPC is that the “little guys” can compete with advertisers with deeper pockets, simply by sticking to their own goals and finding their niche. How do you use competitive PPC intelligence data? Do you find it to be wildly inaccurate, or is it good enough? Share in the comments! Earlier this week, TechCrunch published an article by Samuel Scott called How Google Analytics ruined marketing. It’s a lengthy but important article saying that’s because Google Analytics (and all web analytics packages, for that matter) force marketers into looking at performance by channel, instead of focusing on strategy and objectives. In the years before web analytics, the article says, no one talked about “television marketing;” yet people today constantly talk about “Facebook marketing,” “content marketing,” and even “social media marketing.” These, the author states, are not strategies. I’ve written about strategy so many times that I created an entire section on this blog for it. And yet, on what feels like a daily basis, I hear marketers talking about “Facebook marketing” and the like as a strategy. Here’s the thing: a strategy is a means for achieving a business goal. According to Wikipedia, “marketing strategy has the fundamental goal of increasing sales and achieving a sustainable competitive advantage.” If you read the rest of that Wikipedia page, it reads like a college textbook on marketing. It takes me back to my undergrad and master’s degree days. The point is, we’ve forgotten what we learned in school. Channels aren’t strategy. Lots of marketers mistake tactics or tools for strategy. Sometimes they get stuck on a particular creative idea, and want that idea to become their “strategy.” But ideas aren’t strategy. They’re ideas, and creative is an important part of any marketing mix. But the strategy should help a business achieve goals – not be an end in itself. The same thing goes for calling “Facebook marketing” a strategy. It’s not. This isn’t strategy either! SEO is a channel, not a strategy. Take a step back: why did the person create informational material in the first place? No one creates information material for the fun of it. They’re doing it to sell stuff! That’s the strategy, not SEO. When decision-makers think about marketing strategy (and spending their money on any type of marketing efforts), they have questions in their mind. Back in 2014, I wrote about 7 Things About PPC Strategy Your Clients Want to Know. In the post, the first thing mentioned is campaign goals. What are we trying to accomplish? And “be on Facebook” or “get to the top of Google” aren’t goals. You can spend a bunch of money marketing on Facebook or bidding high on Google, only to find it didn’t generate a single sale. This is why channels aren’t strategy. They don’t achieve goals. Another question in the client’s mind is “how do we know if we’ve succeeded?” Well, if your strategy is “Facebook marketing,” you’ve succeeded the second you put a post on Facebook. And if that’s true, then every crappy company who’s posting to a Facebook page is succeeding. We all know that’s absurd. Remember, a strategy includes goals and objectives. Sure, your strategy may be to “use Facebook to reach our target audience and generate sales of blue widgets” or “engage in SEO to improve visibility of key product pages to increase sales.” But the strategy isn’t “Facebook marketing” or “SEO.” Those are tactics – means to an end. To make sure your strategy stands up, check out my Ultimate Cheat Sheet on PPC Strategy. What do you think? Do you find that marketers understand strategy, or are clients coming to you saying “we want to be on Facebook”? Share in the comments! If you’re reading this blog, chances are you’re a PPC pro – someone who does PPC for a living. At a minimum, you have some kind of interest in PPC: if you’re not doing it for a living, maybe you’re trying to learn, or maybe you do SEO or some other kind of internet marketing and want to understand PPC as part of the marketing mix. Every PPC professional has had at least one campaign that failed in some way. It didn’t meet the expectations of your client or boss. In the agency world, it’s common nowadays to inherit existing PPC accounts that were poorly managed in one way or another and failed to meet client expectations. So what are the reasons why PPC campaigns fail? Is it just incompetence on the part of the PPC manager. Sure, there’s some incompetence out there, as there is in any field. We’ve all seen accounts with a single campaign that’s full of broad match keywords driving to the homepage. But that’s not common. Here are some of the common reasons I’ve seen PPC campaigns fail. As the old adage goes, if you fail to plan, you plan to fail. Setting goals is a basic tenet of any marketing plan, and yet it’s common to see advertisers whose stated goal is “we need to get ads on Google.” Sorry, but “getting ads on Google” is not a marketing strategy or goal. What good is setting a destination if you don’t know when you’ve arrived there? Without proper conversion tracking, you’re flying blind. You’ll never know if you achieved your goal or not. It always surprises me when we see accounts with no conversion tracking whatsoever. It shocks me when clients resist putting tracking codes on their website – and yet it happens more often than I’d like to admit. Refusing to put conversion tracking on your website is like refusing to use a cash register at your store checkout. Sure, you could just have employees stuff all the cash in a drawer – but at the end of the day, how would you know how many units you sold? How can you tell if employees are skimming from the till? Without a tracking system, you won’t. Same thing goes for PPC. I alluded to this earlier – the horror story of a single campaign full of broad match. But PPC campaign structure problems go beyond the obvious. We inherited an account that looked great on the surface: its campaigns were set up by geo location and by brand or non-brand keywords. Problem was, the brand campaigns had non-brand keywords in them, and vice versa. Campaign structure is only as good as the person managing it. You must follow it. So many PPC advertisers have great campaigns, with great structure, keywords, and ad copy – and then they fall down on landing pages. Having poor landing pages while spending money on PPC ads is the equivalent of buying a Super Bowl ad for a dirty, disorganized store with mean sales clerks. It doesn’t make sense. Use landing page best practices to ensure that your online store is clean, well-organized, and ready to convert. Good campaign structure and landing pages are critical to success, but so is good ad copy. In just a few characters, your ad copy must convey what it is you’re offering, what you want users to do, and why they should do it. It’s a tough challenge, and many advertisers fail. Ensure your ad copy is as good as it can be by using this cheat sheet. Campaigns aren’t managed actively, or aren’t managed well. PPC is not a “set it and forget it” medium. Setting up good campaigns is only the beginning. Successful PPC managers spend most of their time optimizing keywords, ad copy, bids, and many other elements of PPC. A lot of businesses wrongly assume that a junior-level marketing staffer can manage their PPC campaigns on a part-time basis. Unless that person has PPC experience, this is almost always a failing proposition. Hiring an experienced PPC manager, whether to work in house or in an agency, is the best option for most advertisers. You’ve done all this, and the campaign is still failing. What now? Sometimes, despite our best efforts, campaigns continue to underperform. What can be done? Check out this post on how to solve the biggest problems in PPC. PPC isn’t for every business. It’s rare, but every once in a while there is a business or campaign that just doesn’t work. At this point, you may have to face the reality that PPC isn’t right for this business. Just make sure you’ve tried all options before conceding defeat. What are some of the reasons you’ve seen PPC campaigns fail? Share in the comments! Matt Umbro started an interesting discussion last week with his post titled Why SMBs Should Not Run AdWords Accounts. He defines SMBs as advertisers with a budget of $500 per month or less, and says that’s not enough budget to compete and be successful. Mark Kennedy wrote a detailed counterpoint on the topic called Paid Search Can Work for SMBs – Even the Little Guys! Both Matt and Mark’s posts were well thought out and made good arguments. “(Adwords) also only really works if you know what the hell you’re doing… It’s so easy to burn through budgets very quickly and pay for clicks from people who never had any intention of becoming a lead or purchasing anything from you. I’ve written before about why inexperienced people should not attempt to DIY PPC. It’s too expensive and there are too many pitfalls, as the Quora poster says above. No matter what your budget, if you haven’t outlined clear goals and set up conversion tracking, Adwords or any other PPC program will not work for you. But what about the small business question? Should small businesses use Adwords? I’ve run small PPC campaigns a few times in my career. Some were agency clients, and some were side jobs I took on. I have to be honest: I haven’t found $500/month clients to be very profitable, for me or for them. In his post, Mark Kennedy offers several examples of small clients who used geotargeting and other tactics to their advantage. That’s great, and it makes sense – but I’ve found that Facebook works much better in most of these instances. Clicks on Facebook are significantly cheaper than clicks on Adwords or even Bing, so your money goes a lot further. Even direct ecommerce or lead generation is more efficient on Facebook at small budgets, in my opinion. Matt Umbro also mentioned Facebook as a good alternative for small advertisers. That’s been my experience as well – small clients are less sophisticated, and need more hand-holding. They often don’t understand basic marketing principles, much less the nuances of Adwords. They frequently have issues on their website that need troubleshooting – and lack an in-house developer to fix them, leaving me to answer web dev questions (which, trust me, is not a good use of their time based on my limited dev knowledge!). So if you spend an hour on the phone answering quick questions, you’re done for the month – or you start losing money on a client that’s already paying you at the low end of the rate scale. It just doesn’t make sense to me. Now if you’re running a small PPC campaign part time as an in-house marketer, and you have some PPC knowledge, a $500 budget might work. But in my opinion, there are better uses of your $500. It’s been interesting to watch the conversation on PPCChat on this topic. What’s your take? Share in the comments! Robert Brady wrote a great post this week over at the Clix Marketing blog called How Valuable Are PPC Skills Anyway? I love the perspective he shared on PPC skills and commoditization – something that’s been talked about a lot in the search blogosphere of late. Some people have wondered whether automation will eventually put PPC professionals out of a job. It’s a fair point. Look at the manufacturing industry, where many jobs have been taken over by machines and robots, and others have been shipped overseas, where labor is cheap. Could the same thing happen in PPC? In his article, Robert postulates that routine PPC tasks can be done via automation. If you’re just doing routine tasks, your job may be in jeopardy. There are tools out there that can do bid management, budget management, keyword research, ad testing, and many other routine tasks. Back in 1983, when I graduated high school, the same number of people were employed in routine cognitive and non-routine cognitive jobs. 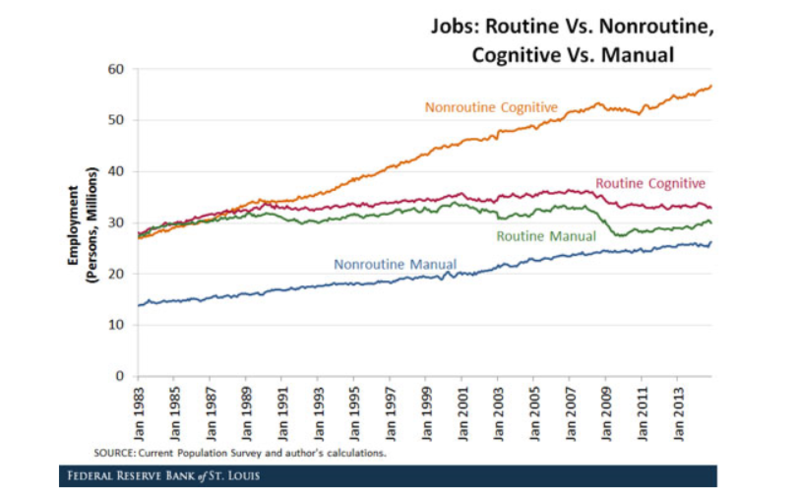 Over the past 30 years, the number of routine cognitive jobs hasn’t grown – the line is nearly flat. But non-routine cognitive jobs have grown – and at a faster rate than the other 3 job types. Strategic PPC is non-routine cognitive work. I can’t tell you the last time I did the same thing 2 days in a row. It doesn’t happen. Are there routine tasks I perform? Sure. Do I do the exact same thing every day for every account? Absolutely not! There is a place for routine work in every job out there. But if you’re spending every day doing routine tasks, your job may be taken over by automation someday soon. It’s my hope that all PPC professionals end up doing non-routine cognitive work. It’s what makes this industry so much fun. It’s also my hope that search marketing conferences start focusing less on how-to tactics and more on strategy. It’s in PPC strategy that our value lies. Do yourself a favor and check out Robert’s post if you haven’t already. And if you’re practicing or teaching assembly line PPC, you might want to start thinking about PPC strategy a little more. Check out the “pay per click strategy” section on this blog. Read blogs by others. Focus on objectives. Ask “why” every day. In short, make sure you’re doing non-routine cognitive work. Did you read Robert’s article? How do you balance routine PPC tasks with non-routine PPC strategy? Share in the comments! Last week, I had the pleasure of speaking at the Salt Lake City Search Engine Marketer’s conference (SLCSEM). I talked about the 7 Things Your Clients Want To Know About PPC Strategy. And then we had a fun “live PPCChat” with myself and Susan Wenograd, with Bryant Garvin moderating. For a recap of the event, check out the writeup on the SLCSEM blog. We covered a ton of different topics in the live discussion, including our thoughts on Bing Ads (they had a rep on our panel, which was super cool), remarketing, and of course, PPC strategy. Long-time readers of my blog know that this is a hot topic for me. Blog posts on PPC tactics abound – if you want to read about keyword research, setting up social PPC audiences, and campaign structure, you’ll have no trouble finding articles on all of these topics. I’ve written a post or two on them myself. We all need to know these tools of the trade. But we also need to know the right time to use the tools. That’s where PPC strategy comes in. I’ve found a surprising number of PPC practitioners who practice what I dubbed at SLCSEM to be “assembly-line PPC.” They have a list of PPC tactics – keyword research, ad copy writing, search query mining, bid adjustments, etc. – and they work their way through these as though they were boxes on a to-do list to be checked off. They’re doing the equivalent of “turning the screwdriver” on an assembly line – performing the same task for every client, no matter what, without really thinking about the final product or the goal it’s supposed to achieve. Now, there’s no doubt that all of these things need to be done. A PPC manager who never looks at search query reports or writes new ad copy isn’t doing his or her job. But none of these tasks are a PPC strategy. If a client (or your boss) comes to you and says “I want to be the first ad on Google,” you should have a serious conversation with them about WHY they want to be there and what they hope to accomplish with that. “Being first on Google” is not a strategy. In a conversation with my boss this week, he said, “It’s about the experience, not the Adwords.” I guess he used this in a client pitch, but it’s right-on when it comes to ongoing PPC strategy too. Some clients don’t belong on Adwords. We have more than one client using strictly social PPC, because it achieves their goals way better than Adwords or any search engine could. Other clients spend more on Bing than Adwords, because it reaches their audience better (and usually at a much lower cost). The point is, PPC campaigns and the optimization performed on them should be based on achieving client goals, not checking a box. PPC isn’t a series of tasks. It’s a means to an end. It’s much closer to practicing medicine (looking at symptoms to solve a problem) than it is building a machine on an assembly line. And yet, posts on PPC strategy are hard to find. 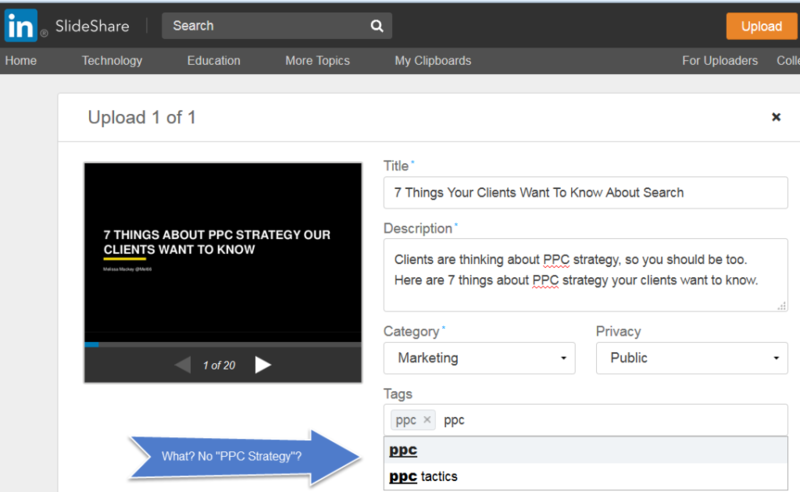 When I uploaded my SLCSEM presentation to Slideshare, I was saddened to realize that the tag suggestions when I typed in “ppc” showed “ppc tactics” but not “ppc strategy.” So I added it. Speaking of the Slideshare, here is my deck. Let me know what you think!